Because food security and environmental health go hand in hand, our goal is to build expertise in farming communities around the world about practical options for improving yields and livelihoods using ecologically regenerative approaches.﻿ permEzone is a non-profit program training and supporting family farmers in the design of sustainable food systems, and the use of mobile phone technology to share knowledge and experience. We are now actively seeking funds for our Phase 2 pilot program which started training a new group of 20 farmers in Uganda in January 2019. Please click Donate, and help in any way you can - thank you!! The permEzone program is now underway, training and supporting farmers in Asumbi village, Migori County, Kenya. This initial phase of the pilot is being delivered in collaboration with the Permaculture Research Institute, Kenya and their partners Community Mobilisation for Regenerative Agriculture (C-MRA). Please consider becoming a regular monthly donor to help fund this pilot program. Working with the existing network of regional Permaculture training centers to help rural communities build their own efficient sustainable food systems. Using cellphones to share knowledge and information in isolated and resource-poor communities. In the longer term, building on the experience of running the pilot, we look forward to expanding the program and building our capacity to facilitate the much-needed transition to more sustainable farming communities and resilient local economies. Permaculture projects around the world have shown that the negative impacts of modern agriculture on the environment can be reversed, and that degraded land can be turned into productive farms. 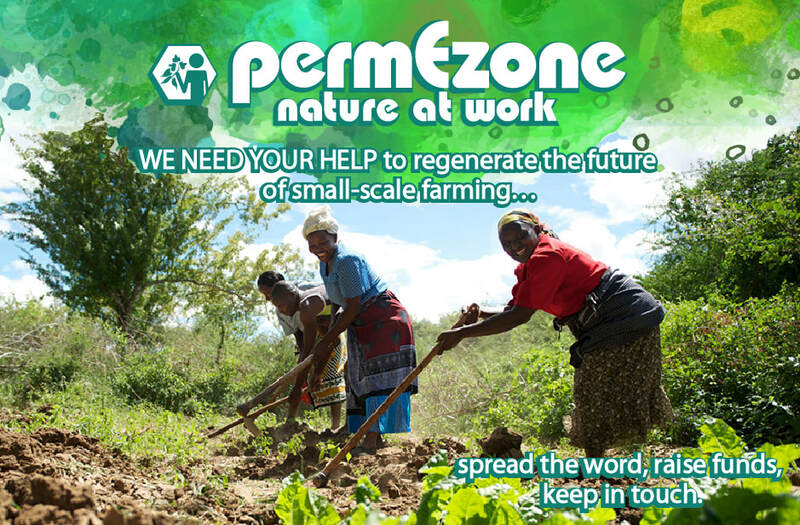 permEzone is a new program working with existing centers in less-developed countries to equip local farmers with practical skills, and then support them in designing model farms. A mobile phone platform, using technology that can benefit the most remote and resource-poor communities, will support the farmers in accessing and sharing information. The world’s 500 million family farmers could be a powerful force for environmental regeneration. Instead of encouraging farming methods that harm the environment and bring mostly short-term benefits, we can help bring sustainable improvements in yields and livelihoods by demonstrating that improved food security and a healthy environment go hand-in-hand. Our program is working with permaculture centers and sponsor smallholders/family farmers to learn about permaculture design. They are then be supported in sharing sustainable farming practices within their community. We take inspiration from the success of permaculture centers like ﻿CELUCT ﻿in the Chimanimani district of Zimbabwe. January 26, 2019: We are delighted to welcome Sheena Shah to the permEzone Project Board, She will have a special focus on developing the permEzone curriculum and supporting the growing network of centers implementing the permEzone program. December 29, 2018: Our December newsletter is now published online here, with the latest from the farmers in Asumbi as they start to improve their soil using organic matter that used to be treated as waste, and a reminder about our crowdfunder for the new pilot in Uganda. December 14, 2018: We have launched our crowdfunding campaign to fund our Phase 2 program with BEU in Uganda. After a four-month process of preparation, the team on the ground are ready to get to work training the farmers as soon as the funds are available. October 24, 2018: Our fall newsletter has been published online here. As the farmers in Asumbi start to develop their model farms, a new pilot program is starting to take shape in Sanje, Uganda. August 8, 2018: Our summer newsletter is out now, with the latest news from the team in Kenya, and updates on how the program is changing and evolving as we learn from the experiences of this first pilot project. May 30, 2018: Our May Newsletter is on its way with news from the team in Rongo as they complete the first ever permEzone training, and prepare to support the farmers as they start to redesign and recreate their demonstration farms. February 12, 2018: Our Annual Report for 2017 is now available to read here. January 22, 2018: Our January Newsletter looks back at a year of achievement in 2017, with gratitude to the many people who made this possible, and ponders the challenges that lie ahead as we start to implement the next phases of the pilot program. December 17, 2017: Our December Newsletter is out today. We send our best wishes for the Holidays, and share the latest news from the training program in Kenya, thanks to our colleagues at Sustainable Village Resources and PRI-Kenya. November 15, 2017: Our November Newsletter is out now, with a report from the Symposium on Climate Change and Droughts in Nairobi, and the latest update from the training program in Rongo and Asumbi. October 16, 2017: Our October Newsletter was published today to coincide with World Food Day. We shared the wonderful news that our training program for the farmers in Rongo and Asumbi is now underway, and that we have a new co-funder for Phase 1 of our pilot program: Greg Zahn! October 13, 2017: Today, our colleagues at Sustainable Village Resources start their training program with the farmers group in Rongo, continuing the next day with the group in Asumbi. We wish them the greatest good fortune as they embark on this voyage of discovery together!! October 3, 2017: We are delighted to welcome Elin Lindhagen Duby to the Project Board, where she will bring her experience as a development consultant and former Director of PRI-Kenya to her new role leading the MEL Team. September 18, 2017: Our September Newsletter is published today, with news from the team in Rongo about further progress in recruiting new farmers, and on the development of the training curriculum, and a special request to our supporters to consider becoming sustainable donors.